I love glitter nail polish. There is only one problem with those pretty glitter polishes though: they are a pain to remove. A pain to the extent that I will skip on glitter polish just because I know how much I'll dread taking it off. I'm all about the glitter polish, except for when things get fussy. Then I'm all about whatever won't take me ages to take off. So when Essie launches a new spiffy product 'Leave No Trace' that promises you to really leave no trace in a matter of minutes.. You get right on it! 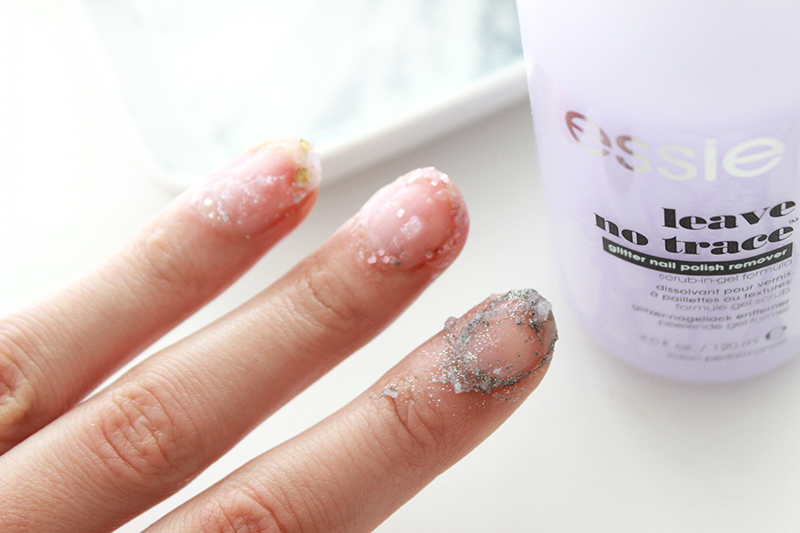 The deal with Essie Leave No Trace is quite simple: this is a thick scrub-in-gel formula that you need to apply on your nail and then let it work its magic for about 30 seconds. It'll tackle any hard-to-remove nail polishes that you might be dreading to take off: not only glitter, but also texturised nail polishes. I've tried this formula out on a few different glitter polishes, from the smallest texturised glitter to the bigger glitter flakes. They're all so pretty! When the 30 seconds are up you need to gently massage the gel onto your nail bed - you'll notice the glitters to loosen immediately. Then all there's left to do is grabbing a cotton pad and taking it all off. On the picture you see my nails after that one swipe - pretty impressive, right? I cleaned it up a little more with the cotton pad and after a good hand wash there was no glitter to be found on my nails anymore. Easiest glitter removal.. ever? 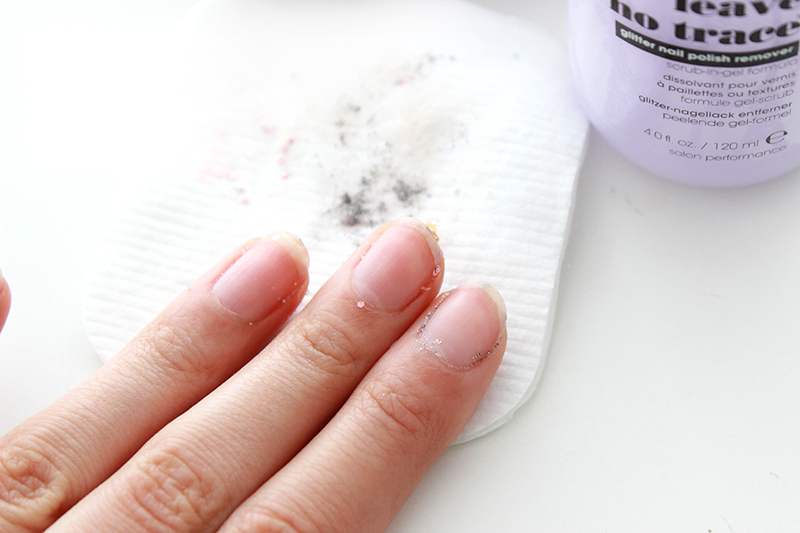 This definitely beats my previous preferred way of removing these kinds of polishes of making tin foil squares lined with soaked cotton pads to wrap around your finger! The formula does contain acetone (hey, it takes some power to tackle some of these pretty glitter polishes), so you might want to moisturise your cuticles straight after using this one. I haven't found much info and reviews about this new product, so I guess it's still to be launched in most countries. In Belgium it's been on the shelves since this March and I've spotted it on sale on the Boots website as well. 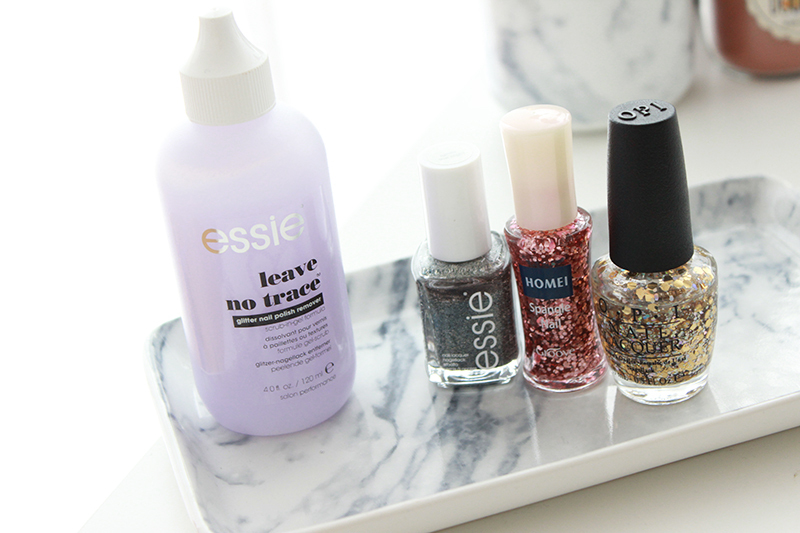 Definitely worth a try if you're a fan of the glitter mani!